Hiya guys! I'm still playing catch up from a week of no swatching. My inner planner girl is freaking out, but almost loving this time crunch in some weird way. I blame all the acetone fumes in my mani cave, haha. Today I'm sharing swatches for the Contrary Polish's June contribution to the Polish Pickup Collaboration. If you're not familiar with the concept, the Polish Pickup offers a fun, interactive experience that allows you to submit theme ideas, vote for your favorite theme, and selectively purchase your favorite polishes every month. This month the theme is.... Under the Sea. It's time to let loose your inner mermaid and brace yourself for an underwater polish extravaganza! 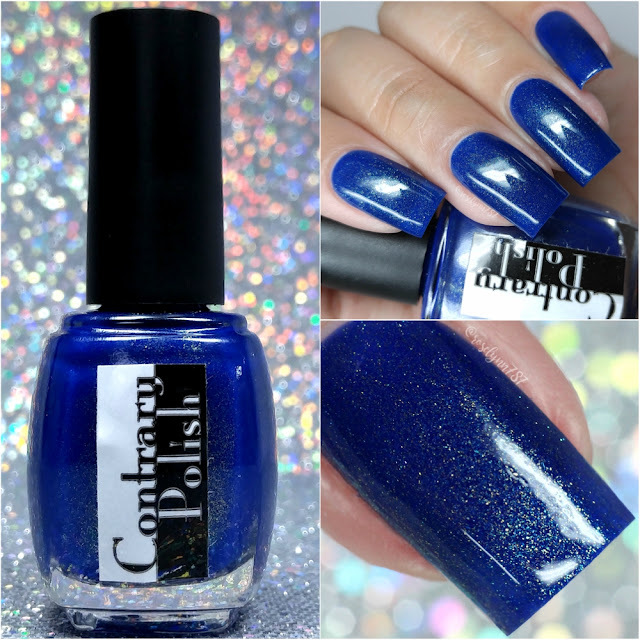 Lucky Star by Contrary Polish will be available for purchase through the Polish Pickup Shop June 2nd through June 5th. This full-size shade will retail for $10.50 each. Lucky Star can be described as a cobalt blue filled with gold glass fleck shimmer. Don't worry, I'll gave you a minute to wipe the drool haha. This is an absolutely stunning color combination, the gold reflects so well on the deep blue base. It also has that sort of jelly-squishy look to the finish that makes it stand out that much more. And let me tell you, that shimmer is even more breathtaking in person! Carrie's contribution was inspired by a photo of the Blue Linckia starfish. It's such a magical looking creature, I was in awe from the moment I saw the photo. It's like something out of a fantasy land. Apparently these starfish can be found in the shallow waters of the tropical Indo-Pacific ocean and are commonly dark and light blue. The formula leans on the sheer side, but has enough opacity in the application for easy coverage. It builds-up evenly on the nail, with plenty of shimmer distributed in each brush stroke. The consistency is perfectly balanced, not too thin or too thick. And despite the intensity of the blue there is no staining on removal to my nail or cuticles. Shown in two coats and sealed with a glossy topcoat. Overall I think Carrie has been absolutely killing it every month when it comes to the Polish Pickup. She manages to capture her inspirations flawlessly whilst creating gorgeous unique shades. Definitely one of the must-have shades for the month of June. Though I'll admit this month I'm a little biased since blue is one of my favorite colors to wear, haha. But tell me I'm not the only one going gaga over this!? Let me know what you'll be picking up this month in the Polish Pickup event. To recap, Lucky Star by Contrary Polish will be available for purchase through the Polish Pickup Shop June 2nd through June 5th. This full-size shade will retail for $10.50 each. Amazing blue! I love everything I see from Contrary lately. Im still kicking myself for missing their May Polish pickup shade. The color is so rich! I love it. You caught the shimmer perfectly! Such a gorgeous color on you. Love the gold glass flecks! They're amazing! Wow. That spray of gold makes this just divine...Love. This vibrant blue makes me happy and your pictures are to die for, as usual! You capture so much detail in your macros. Gorgeous! I love the shimmer. Oh wow, what a stunning polish!